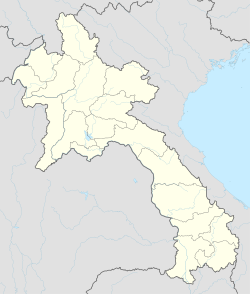 Xam Neua (ຊຳເໜືອ [sám nɨ̌ə], Vietnamese: Xâm Neua or Sầm Nưa, sometimes transcribed as Sam Neua or Samneua, literally "northern swamp", is the capital city of Houaphan Province, Laos, in the northeast of the country. Xam Neua is one of the country's least visited provincial capitals by Western tourists. Residents are mostly Lao, Vietnamese, and Hmong, with some Tai Dam, Tai Daeng, and Tai Lu. The predominant language is Lao with minorities of Vietnamese and Hmong. French is spoken by a minority of people as a legacy of the French colonial era. It is taught in schools and used in public works and government. Xam Neua is in a valley in Houaphan Province. At 05:45 and 17:45 each day there are public addresses from loudspeakers atop a tower on the school playground, expounding on communist life and philosophy. These addresses are usually accompanied by Lao music. It is said that there is a Communist re-education camp in Xam Neua and that it was the Pathet Lao capital during the Laotian Civil War Battle of Lima Site 85 (LS-85), 11 March 1968. It is near the Pathet Lao refuges in the Viengxay caves, which the Lao government hopes to promote as a tourism destination similar to the Củ Chi tunnels near Ho Chi Minh City in Vietnam and the Killing Fields Memorial near Phnom Penh in Cambodia. It is near Nam Et-Phou Louey National Protected Area (pronounced "naam et poo loo-ee"). Wikimedia Commons has media related to Sam Neua. ^ "Nam Et". Archived from the original on 2011-06-14. Retrieved 2010-09-25.